One of the key challenges with direct steam injection is the exposure of your product to high-temperature steam. This can result in fouling and discolouration to delicate sauces such as béchamel sauce. Also, when processing tomato based recipes, often there are problems with the product turning orange due to the over processing of tomato. Steam Infusion stops exposure to excessive temperatures and Maillard reactions because of the partial vacuum generated by the Vaction™ Unit as it heats, mixes and pumps products in your vessel. From a development perspective, this is great as products appear cleaner and are a better match to your concept sauce. Your production team will love you as well as cleaning is easy with no fouling to your vessel. Direct steam injection is a relatively simple process whereby you're bubbling steam through a sauce. Naturally, it's going to heat up your product quicker but there's not much else going on. With Steam Infusion allowing more control over the steam flow rate, we change the operating characteristics of the Vaction™ Unit from a gentle introduction of steam to a disruptive high shearing process environment. This control enables us to improve the performance of your ingredients; for instance, we can create a creamier mouth feel as under certain operating conditions we can create a fat mimetic. One of the main reasons food manufacturers add direct steam injection to their cooking vessels is to speed up heating times. The way steam injectors operate creates a compromise between heat up times and efficiency, because, as you increase the flow rate of steam, more is lost into the atmosphere as it bubbles straight through the product. Minimising plant downtime is very important for food manufacturers operating at close to full capacity. Steam injectors are normally installed in the vessel jacket leading to complex installation on retrofits, whereas, Steam Infusion lance is simpler as it can be mounted onto the vessel lid in vessels with inclined agitation. As the cooking vessel experiences no burn-on, it is possible to perform more back to back cooks with a Steam Infusion system without the possibility of for instance burnt contaminates appearing as flecks within the product. Similarly, when a clean is performed, the automated CIP or manual clean process is much quicker as burnt on product no longer needs to be removed. 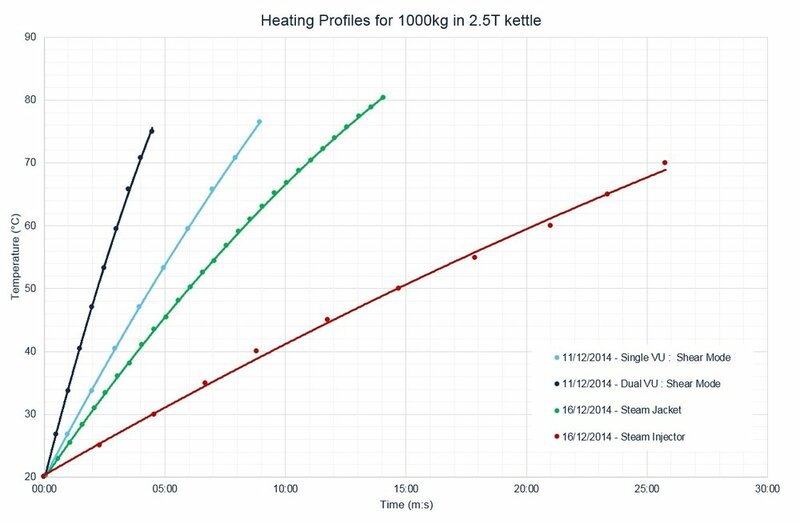 Our white paper explaining how to improve dairy sauces with Steam Infusion explains in greater detail the benefits that can be achieves with Steam Infusion. Download it today or get in contact to find out more.